McFarlane Toys, continuing the proud tradition of their Legends lines and Sports Picks, presents: the Cooperstown Collection Series 3. 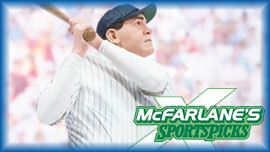 The first "Legends line" offered by McFarlane Toys was the original Cooperstown collection, which was released amid much celebration back in July 2004. The third edition of the Cooperstown Collection will have five Hall of Famers and one baseball icon.